THE FIRST floor of the new Flats at Hanover features a cafe and office space, including one unit occupied by the nonprofit that helped finance the renovation of the 121-year-old building into 32 small apartments. For the Capitol Regional Development Council, having a Queen City office makes sense. The Manchester/Bedford area accounted for nearly $2.9 million of the loan funding the nonprofit disbursed last year, about 60 percent of its total lending. The deals represented seven of the council's 27 projects for the fiscal year that ended in September.It's also convenient for CRDC Executive Director Stephen Heavener, who lives in Bedford and finds himself spending more time in Manchester these days. "We've started to do more and more lending out here because this is where the market is," Heavener said recently at the Queen City office he's adorned with abstract art. The CRDC board, which remains committed to its Concord-area base, agreed to rent the space for a year, he said. CRDC's recent projects include New Morning Schools in Bedford and North End Montessori School in Manchester. Two years ago, it helped finance the renovation of GYK Antler's headquarters as part of the marketing and advertising company's deal to purchase the former R.G. Sullivan cigar factory building on Canal Street. The CRDC steps in to help fill funding gaps in deals that otherwise might not get done. 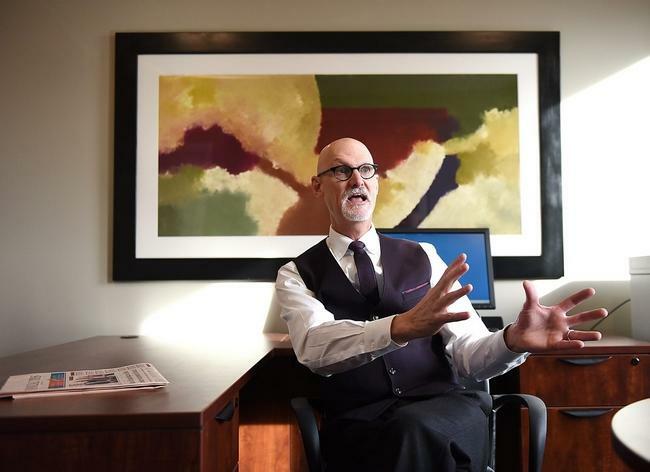 Businesses such as hotels, restaurants or retail stores - low-risk ventures that make up the backbone of New Hampshire business, Heavener says - want to buy a building but cannot qualify for the entire loan amount. Banks turn to the CRDC to kick in $200,000 or $300,000, generally about 10 percent of the overall financing. Most of the CRDC's work is in Sullivan County, Merrimack County and eight communities in Hillsborough County, including Goffstown, Manchester, Bedford, New Boston and Amherst. Its mission is to invest in projects that create or retain jobs and enhance the property tax base. The CRDC secures grants and loan funds from the Small Business Administration, the U.S. Department of Agriculture and other federal sources. It recently found itself needing to increase its investments from its own pool of money. "A couple of years ago my board looked at our balance sheet and said we have too much cash," Heavener said. "We have an endowment that we need to maintain, but we also had a million dollars in what we call free cash. It wasn't program money ... It's our cash that we've earned over 60 years. And the board said we need to deploy that money to mission work." So the CRDC started being a bit more flexible as it looked for deals, Heavener said. "Interestingly enough in the last year we've deployed money into three residential projects," he said. "They all have commercial components, but the majority of this asset we're sitting in right now is a residential building: 32 units and five offices and a cafe." The Flats at Hanover was previously known as the Farnum Center and was owned by Easter Seals, which ran a drug treatment center there before relocating it to Queen City Avenue a couple of years ago. The five-story brick building - built in 1895 originally as an apartment complex - sat vacant for a couple of years before the Elm Groves Companies bought it for $225,000. It financed the multimillion dollar renovation of the building primarily through Franklin Savings Bank. The CRDC, which usually carries the second mortgage on the deals it makes, covered nearly $300,000. "It was the first time we had ever done a majority residential deal, "Heavener said. "It was a dilapidated building in an up and coming part of the town, as the development moves eastward on Hanover Street. It's a great opportunity here. It increases the tax base dramatically with this building ... It brings young people to this part of town." Heavener, 62, has spent most of his career in economic development, which has included stints in Vermont, Maine and Keene. He joined the CRDC nine years ago, returning to New England after working in Virginia and Wyoming. "When I was hired in '07 I told the board I want this to be my last job," Heavener said. "I'll probably work another eight to 10 years just because I love what I do. We have so many touches with companies. But for our involvement many of the projects don't get done." Heavener considers them little victories. "It's not a giant number, but we have 150 borrowers in our loan portfolio, about $40 million that has gone out. That's 150 companies that we've touched and helped grow. With the bank, of course. The bank is always involved." In 2015, when the CRDC only made nine loans, the banks weren't calling all that much. "All the commercial banks in this market all have so much cash that they haven't brought us in on a lot of deals so the deals that they do bring us in on are more challenged," Heavener said. "Because if you can do a 75 percent loan, you want to book it in your portfolio. The interest spread right now is so low in banks that they're barely covering their costs because it's so competitive." The CRDC had a busy 2016, and activity has been spiking this fall, with five applications under review right now, more than double what it handled each month last year. While it's too early to call that a trend, Heavener said, it usually means banks are hedging their bets. "There is a strong demand for our product, which means lenders are being more cautious," he said. "They're starting to pull back a little. I think some of the terms are going to be a little more challenging for the borrowers. We're all hoping the Federal Reserve raises rates in December. PHOTO CAPTION: CRDC Executive Director talks with Union Leader Business Editor, Mike Cote from CRDC's new Manchester Office located in the Flats on Hanover Street.